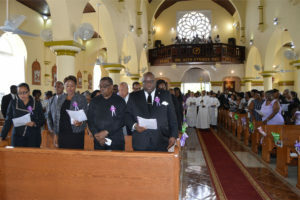 BASSETERRE, ST. KITTS, (August 25, 2017 ) — Prime Minister of the Federation of St. Kitts and Nevis and members of the Federal Cabinet, were on Thursday August 24 among hundreds who paid their last respects to the late Mrs Rosemary Powell, wife of Ambassador HE Micheal O Powell. Mrs Powell passed away on August 12 at the age of 69. The thanksgiving celebration mass for her life was held at the Co Cathedral of Immaculate Conception, Basseterre, where she was a member. It was officiated by Fr. Manuel Antao, Fr. George Ager, and Fr. Bernard Latus. With the Prime Minister at the church service were cabinet collegaues Deputy Prime Minister the Hon Shawn Richards; Senior Minister and Minister of Ecclesiastical Affairs Hon Vance Amory who is also the Premier of Nevis; Minister of Public Infrastructure, Post, Urban Development and Transport, the Hon Ian Patches Liburd; Minister of State for Health Senator the Hon Wendy Phipps; the Federation’s only living National Hero and First Prime Minister of St. Kitts and Nevis the Right Excellent Sir Dr Kennedy Simmonds; Ambassador His Excellency Sydney Osborne; Cabinet Secretary Mrs Josephine Huggins; Permanent Secretary in the Prime Minister’s Office Mr Osbert DeSuza and Senator the Hon Akilah Byron-Nisbett. 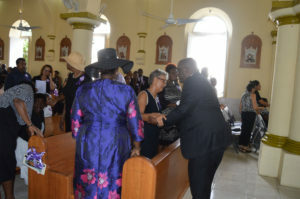 Family members and family friends thronged the church to give a fitting farewell to the Late Mrs Rosemary Olpherts Markes Jordan Powell, who was described by Father George Ager as having prepared herself and was ready for the heavenly journey. As a tribute to her long service on the church’s senior choir, the congregation sung her favourite song ‘On Eagles Wings’. Interment of her mortal remains was done at the Springfield Cemetery where a number hymns were sung by the many people who turned up.